Ask fellow campers about "Lakewood Village Resort" and nearby attractions. Indoor pool, $$ laundry, small lake for paddle boats/canoes/swimming. Coast to Coast members are in a section separate from member sections of the resort, full hook up but, w/30 amp service only. We camped at Lakewood Village Resort in a Fifth Wheel. Neil Armstrong Space Museum 1/2 mile, Walmart, grocery etc. 1 mile, Wapokeneta center 2 miles. Wi-Fi was very weak even though we were less than 50 yds away. Rate is C2C member rate. We were late arrivals and used button at gate. The manager said to go to the back row and pick any site. They were 30 amp only. The sites in the front of the park are nicer and sold as time-shares. There are several resident seasonal campers and they were very unfriendly. Not a bad place for a short stay. Has nice facilities in front of park and they are available to all. We camped at Lakewood Village Resort in a Fifth Wheel. We used this park for a two-night 'overnight' to allow us to visit family in the area. When I reserved the site, I asked for a 50A site with access to the satellites: I did not use the water, sewer, or cable. When we arrived, the staff didn't know we were coming; when we said we weren't C2C, they didn't want to let us stay. It turns out that they are under new management, but they ended up honoring the offer made by their predecessor. I was told to 'pick a site anywhere on the last row and let us know.' Unfortunately, I picked a site and started setting up before checking the power. It was only 30A; it turns out that, of the 15 or so sites, only two had 50A, and I had to check till I found one. Otherwise the power was good, but there was definite age on the pedestals and receptacles. We camped at Lakewood Village Resort in a Motorhome. Very nice resort type park with lake and indoor pool. An unusual feature is that after you are there you just go out and pick your own site, nothing is assigned and the office apparently doesn't know or care where you are. Sites are heavily treed and difficult to get satellite reception. Rate is Coast to Coast. We camped at Lakewood Village Resort in a Motorhome. Coast to Coast rate. Nice indoor pool. Now have a few 50 amp sites. Older park but fairly well maintained. Great laundry. Easy access from I-75 We camped at Lakewood Village Resort in a Fifth Wheel. Stayed here on Coast to Coast. Good location off the freeway but not noisy except for a train once in a while. Has good Verizon cell, Verizon Internet and DirecTV. Person in office was not knowledgable about if sites were clear for satellite or how to pull into the spaces. Turned out okay. Weekends have activities. Nice open spaces for walking the dog. I'd stay here again if passing through. Armstrong Space Museum is fun. We camped at Lakewood Village Resort in a Motorhome. Very quiet park while we were here. Nice place for a stop over. Great laundry room and good Wi-Fi. AT&T data and voice OK. We stayed here using C2C hence the $10 rate. Friendly staff. 3 nice lakes. We camped at Lakewood Village Resort in a Motorhome. We have stopped here in past years for overnight rest on our way north. Park is clean, gravel roads and sites are in good condition. They now have Wi-Fi and it works good through most of the park. We used Coast, and would stay again. 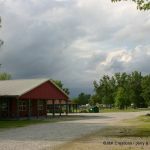 We camped at Lakewood Village Resort in a Travel Trailer. We stayed in a level, gravel pull-through long enough for our 37' 5W. The truck was parked across the front. The trees between sites were small so our rooftop dish worked fine. Sprint cell access was poor but usually worked. The indoor pool was very nice. Roads are gravel and well graded. We stayed under our AOR membership. Very quiet here during the week in mid September but lots of weekenders and kids. Just off the expressway but very little road noise. One hour to Dayton and excellent Wright brothers historical sites and Wright Patterson AFB/USAF Museum. Armstrong Air and Space Museum was disappointing. We camped at Lakewood Village Resort in a Fifth Wheel. We normally stay at the Keep on Adding campground when in this area, but I had noticed this one the last time so I called and the lady said that they sometimes take over niters so I gave them a try. The entrance was very nice with lakes everywhere. The rest of the ground was just OK. The electric breaker would kick with just the air on and I was only pulling 12 amp. I would still stay here over the KOA. We camped at Lakewood Village Resort in a Motorhome. We stayed here in September 2006. Very nice campground with 30 amp. Close to freeway so hear freeway noise when outside. Otherwise quiet. Nice personnel. Great indoor swimming pool. Campfire rings and tables at each site. We camped at Lakewood Village Resort in a Motorhome. Are you affiliated with Lakewood Village Resort ?